Umesh Pun/Republica Vote counting underway at the City Development Training Center of Pokhara on Monday. POKHARA, May 16: Nothing else but the topic of election has gripped people in Pokhara at every crossroad, grounds, public area. They voted on Sunday and have not taken rest since than, anxiously waiting to know who would win and be the mayor of Pokhara- Lekhanath Metropolitan City. “Such a huge mass would never be seen around. 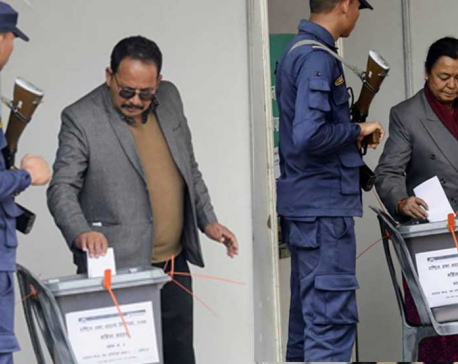 Not even during festivals,” noted Jhavi Adhikari, a local businessman, who was spotted standing outside the vote counting center on Monday afternoon. “Officials are counting votes inside. I feel both nervous and excited while standing here and listening to the updates” he added. Adhikari, like others standing in front of the gate, has been continuously receiving every updates on the vote count from within the counting center. On and off, he gets to his source, comes back and shares the status with his friends. “You can’t help feeling anxious. Whether the one you voted for is taking lead or someone else - this anxiety keeps you constantly bothered. It’s natural after you vote,” he explained. He shared that the excitement and concerns among voters, not witnessed in past, is obvious considering the fact this is first local level polls for the newly structured local bodies. Unlike in the past, federal provinces are getting representatives and the center has now been dismantled and moved to the local level. “It is a matter to celebrate. For the first time in the history of our country we are seeing this kind of local level elections. This is a new era of politics and we should celebrate it,” he stated. Not just a youth like Adhikari, but also scores of aged people are talking about the elections wherever they meet their peers, friends or relatives. Sharing anecdotes of the previous elections, comparing the present and past elections and assessing new poll results has kept almost everyone busy in the city. Adhikari stated that the older generation also looks forward for the new leadership to pave way for the development and prosperity of Pokhara now. “We all could have stayed at home and listen to the news on radio or TV. The excitement is so overwhelming and irresistible that some people are even staying nearby the vote counting center,” he stated. General public is not allowed inside the facility where the votes are counted. However, Pokhara residents have been thronging there waiting anxiously for updates from inside. “We are not allowed to get inside the premise. But the election officials periodically announce the updates through loudspeakers. 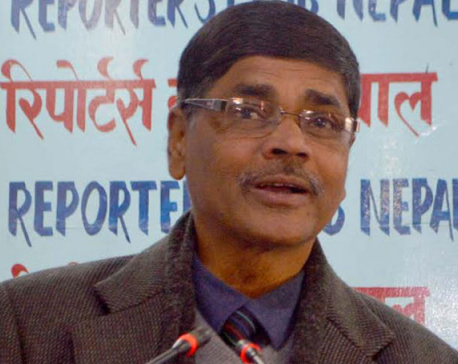 As soon the upd ates are announced, we phone and relay it to the concerned people,” Adhikari said. “Every time fresh updates are announced, people start analyzing each of the candidate’s position and start speculating the winner,” he added. “I was taking a stroll around the lakeside and chatting with friends about the election outcome. I could have returned home and received updates from tertiary sources. But you could feel the excitement around and I came here to be a part of this historic moment,” said Kedar Sharma, president of Pokhara Tourism Council. “Now we are going to get a mayor with great powers to develop this city. We feel really great about it. After coming here and joining the crowd, I saw the excitement and zeal in people’s face. It’s really encouraging” he said. He said that such moments won’t come again in life and therefore he chose to be part of the excitement. “The excitement that we are seeing around is totally different than past elections. You can literally feel the thrill and excitement, every time the loudspeaker blares and announces the updates,” he narrated. Though the public expected the vote count to begin right after the voting was over, it was delayed by a day. But even the next day, excited and curious public had reached at the vote counting center before the election officials. One of such curious voter is Sushil Poudel. Poudel said that he had reached at the center two hours before vote count started in the morning. “They started it a bit late. But I was patient,” he said. Commenting on the excitement, Gangalal Subedi, regional election officer, said that the election will be electing a mayor for the city with executive powers that earlier mayors did not had and added that the excitement is an expression of that happiness. He informed to Republica that each vote counting team comprises of five election officials and representatives of contending political parties. “To expedite the vote count, we are planning to add more counting teams,” he said. Ramji Kuwar from Nepali Congress, Man Bahadur Shahi from CPN - UML and Bishwo Prakash Lamichhane from CPN (Maoist - Center) has been contending for the metro’s mayoral post.